Last night we went to the pub after checking into the hostel. We had a few beers and watched the soccer. The pub had a really huge collection of currencies from all over the world. They didn't have any notes from Cambodia though. So I gave the bar lady one and she was pretty happy I think. Didn't give me a free drink though :-(. In the morning we went to pay for the room for tonight. They told us they were booked out even though the night before they had said we didn't need to book until the morning. This was fairly annoying as it was a nice place and the location was quite good. We couldn't find anything else less then 23€ a night. We decided to try camp in a park. But then we looked on the Internet and found a camping place that was 20€ for all of us. We decided to go there and it was quite good. 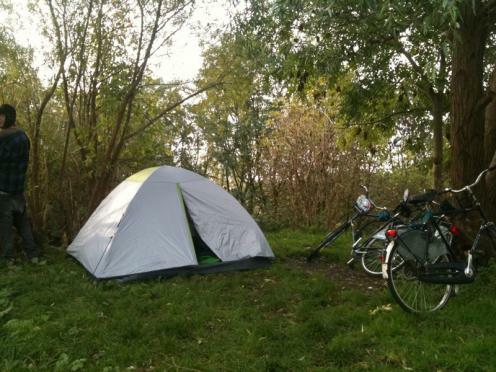 We were able to rent bikes there as well which was good because the public transport is quite expensive in Amsterdam. The tent was really cold and uncomfortable but we expected this. We saved alot of money this way so we didn't really mind.